Flight of the Conchords’ Bret McKenzie, better known here as Figwit, is offering the chance to meet him for a Fair Trade coffee and a chat in this auction run by Oxfam. The winning bidder gets to have coffee with McKenzie and will receive a guitar signed by McKenzie and his Conchords partner Jemaine Clement. It’s Tinseltown’s biggest celebration – the Oscars take place tonight! And already here at TORn we’re busy planning and getting excited for our party next year! In honour of today’s awards ceremony, and thinking back to the ‘Return of the One Party’ which TORn held in 2004, here’s a picture of the Oscar Annie Lennox won that night, for Best Original Song, ‘Into the West’. The statuette was on display last year at London’s Victoria and Albert museum, in their wondeful ‘The House of Annie Lennox’ exhibit. 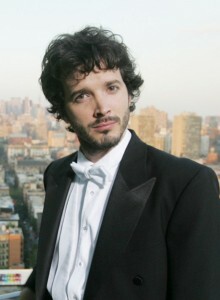 Let’s hope there’s another Middle-earth winner tonight; Bret McKenzie is up for Best Original Song for ‘Man or Muppet’. Go Bret! TV Watch: Bret McKenzie Is An Oscar Nom AND Tolkien Elf! Bret McKenzie is a young man, and his bucket list is almost complete. There are already a lot of Oscar winners working on The Hobbit. Soon there might be one more. When the Academy of Motion Picture Arts and Sciences announced the 2011 nominees, Bret McKenzie (“Figwit” in The Lord of the Rings and Lindir in The Hobbit) turned up in the “Music (Original Song)” category for his “Man or Muppet” from The Muppets. Congratulations and good luck to Bret! 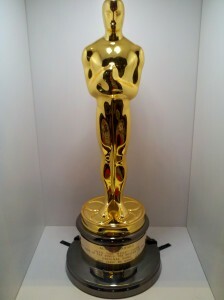 The Oscars will be awarded on February 26. By the way, the highest number of nominations went to Martin Scorsese’s Hugo. Like The Return of the King, it bagged eleven–also without a single actor nomination. The parallel isn’t complete, since Hugo made it into two categories that ROTK didn’t, Sound Editing and Cinematography. It was not in two categories that ROTK won, Makeup and Original Song. For a full list of nominees, check out the Academy’s website. 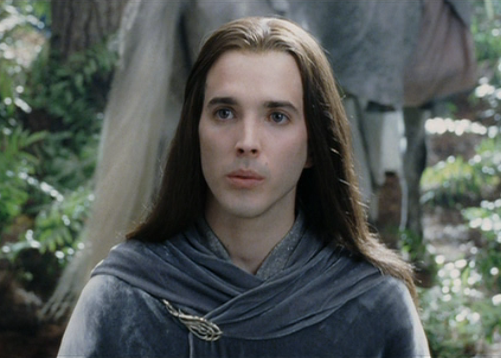 Bret McKenzie, who unofficially played “Figwit” the Elf in The Lord of the Rings, spoke with ComingSoon.net about his role as Lindir in The Hobbit. ComingSoon.net promises the full interview will be available soon. Thanks to Ringer spy Daniel J. for the heads-up. I look much more like a girl in The Hobbit. I look like a hot girl. 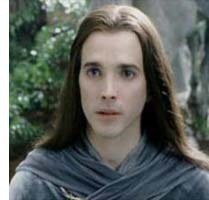 The name Figwit of course, is believed to have originated right here at TheOneRing.net when sharp eyed fans noticed him at the film version of The Council of Elrond and asked, “Frodo Is Great Who Is That?” Whatever the source, the character created such an internet stir that it is rumored to have caused Peter Jackson to give him a line with Arwen in the Return of the King film in a pick-up shot. McKenzie is his usual entertaining self and you can read the whole article and catch McKenzie in his LOTR glory atEmpire Magazine.